One of these years, the SPFL is going to get through a season without a major hubbub over their scheduling of matches. But you’ve got to wonder how many of us are going to be alive to see it. You can have a go yourself. As of Friday evening, 94% of voters said no, the only surprise being that as many as 6% of football fans actually think this is a good idea. You could run another poll asking Scottish football fans what day of the week it is and you wouldn’t get 94% agreement. When supporters reach a consensus on anything in this country then you know that something remarkable is happening. The SPFL have got themselves into any amount of scrapes over scheduling in recent times. But the thunder that’s greeted their decision to host Aberdeen v Rangers at 12:00 GMT on Sunday 28, October before clearing the stadium and having Hearts v Celtic kicking-off at 19:45? That might just be the gold standard of administrative tomfoolery. More than that, in announcing the details of the double-header, the SPFL’s secretary Ian Blair said that he was “pleased to have come to an arrangement that suits everyone”. When Hearts and Aberdeen were voicing their opposition to the plan what words, exactly, was Blair hearing? Quite obviously the Hampden plan doesn’t suit everyone. The double-header throws up all manner of transport and policing and safety issues. Although SPFL chief executive Neil Doncaster later said he had “huge sympathy” for the “inconvenienced” travelling fans, the scheduling cements in the minds of some that the organisation couldn’t care less about them. Craig Levein calls it the “craziest thing”, “beyond belief” and “absolute madness”. The Hearts manager didn’t sound much like a man who was “pleased” at the arrangement that “suits everyone”. He says that having a combined total of 100,000 fans from both clubs in Glasgow at the same time “could go wrong”. He asks, ‘why tempt fate?’ when there are other options. This is Hearts’ first cup semi-final in five years. The club, like all clubs, is trying to connect with its young supporters, but how many of them will be there to see it? A 19:45 kick-off on Sunday night not long after Aberdeen and Rangers have played each other? Even with the assurances of Police Scotland, is that an environment into which you’d be happy to bring your children? Some – many – would think twice about it. The occasion would be diminished as a consequence. 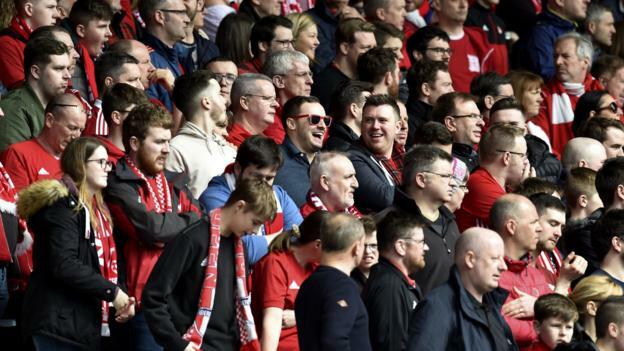 Manager Derek McInnes says that it’s “really unfair” on the travelling Aberdeen support. And he’s right. In reminding everybody that Aberdeen fans can’t physically get from their city to Glasgow on a train ahead of the current kick-off time he had a weariness of a man who had been in this movie before. The anger surrounding the scheduling only hardened on Friday afternoon when, in response to questions from football fans about whether they were intending to put on extra trains, ScotRail tweeted: “Our events team wasn’t consulted by the SPFL in advance of its announcement, which is disappointing. The SPFL has only now been in touch after the announcement”. Soon after, Stewart McDonald, member of parliament for Glasgow South, announced that he was worried about the pressure all of this would have on his constituents around Hampden. He called on Doncaster to reconsider the decision. In fewer than 24 hours, the SPFL managed to alienate vast numbers of fans, bring on the opprobrium of two clubs, annoy ScotRail while making their decision a matter that is exercising a parliamentarian. In the Aberdeen club statement on Thursday, the words “appalled” and “completely unacceptable” were used. Hearts owner, Ann Budge, said she was “astonished” at the SPFL’s solution. Again, you have to ask where Blair got the notion that this was a solution that suited everyone. There were other options and everybody knew what they were. Play one semi-final at Hampden and the other at Murrayfield. No, said the SPFL. Contractual obligations ruled that out. Next, move Aberdeen v Rangers to Sunday at 15:00 and move Hearts v Celtic to the following weekend while rearranging that day’s league fixture between those to side to another time. No, that couldn’t be done either. Instead, the Hampden double-header was born and the fiction that the outcome suited everyone was floated. The host broadcaster, BT Sport, is undoubtedly one of those parties who are pleased, but they don’t have much company in happy-land. The BBC Scotland poll says that 94% of football fans disagree with what the SPFL have done, but the voice of the majority has been drowned out. Over and over again they hear that their opinions are valued and over and over again they feel that they’re not being listened to. This is another example of it. One of the worst.